Take your vehicle from average to fantastic with FanWraps! 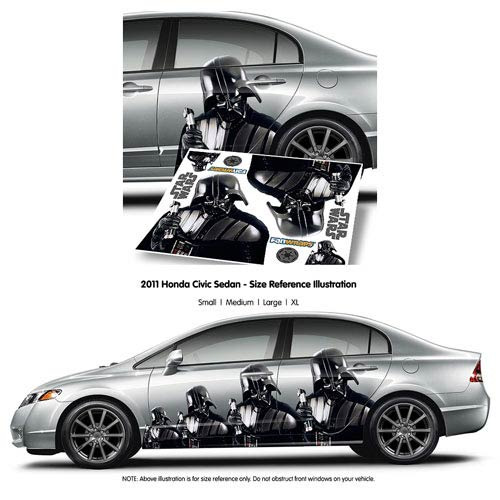 This Star Wars Darth Vader FanWraps Car Decal allows you to deck out your car with the one of the coolest and most badass Sith in the galaxy - Darth Vader! This great set of decals includes 2 main decals of Darth Vader along with Galactic Empire logo decals and Star Wars logo decals - it's a must-have for fans of the iconic Star Wars series! FanWraps decals can be used as partial vehicle wraps and are able to adhere to any automotive surface as well as most other surfaces throughout your home, office, apartment, or dorm room. FanWraps will stick to almost any type of surface you can think of! FanWraps are UV resistant and water proof; they're safe in car washes and leave the surface completely clean on removal. DIY instillation.